"Mama and Papa Lala: 30 Years of Hatch-Billops Films" will screen all six films by James Hatch and Camille Billops, whose extensive collection documenting African American culture is housed at Emory’s MARBL. Emory Photo/Video. "Mama and Papa Lala: 30 Years of Billops-Hatch Films"
10 a.m.: Screening of "Take Your Bags" (1998, 11 min.) and "The KKK Boutique Ain’t Just Rednecks" (1994, 60 min.). Comment by Louis Massiah, Scribe Film and Video Center. More information for "Mama and Papa Lala: 30 Years of Hatch-Billops Films" is available here. 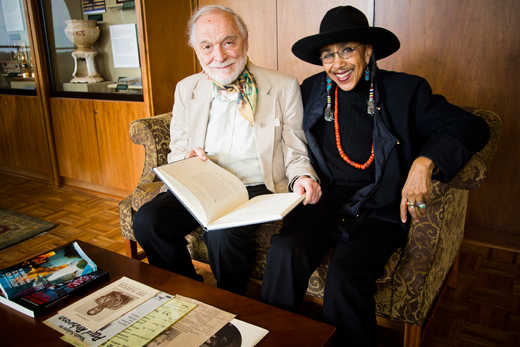 A film festival celebrating the lifelong work of filmmakers Camille Billops and James Hatch will kick off a series of events leading to a 2015 exhibition of the Billops-Hatch collection at Emory University's Manuscript, Archives, and Rare Book Library (MARBL). "Mama and Papa Lala: 30 Years of Hatch-Billops Films" will be held Oct. 2-3. Billops and Hatch have spent more than four decades collecting African American culture and art; their films examine gender, race, class and history. Their archives have been housed at MARBL since 2002. The event features screenings of all six films produced and directed by Billops and Hatch. Screenings begin at 3 p.m. Thursday in White Hall on Emory's campus, followed by a reception at 6 p.m. in the Schatten Gallery at the Robert W. Woodruff Library. Valerie Smith, professor of English and African American studies at Princeton University, will present the keynote at 7:30 p.m. in the Jones Room at Woodruff Library. On Friday, film screenings begin at 10 a.m. in White Hall and will feature commentary on vintage Billops-Hatch family movies at 4 p.m. by Jacqueline Stewart, professor of cinema and media studies at the University of Chicago. The festival will conclude with a sneak preview of "Mama and Papa Lala" at 6 p.m. The title of the film retrospective is derived from a poem written by Camille Billops, says Pellom McDaniels III, faculty curator of African American Collections at MARBL. "'Mama and Papa La La' reflects the lives of two of the most interesting people I have ever met," McDaniels says. "They have traveled and seen the world together. They have experienced the joys of love and growing long in years, and the disappointment and sorrow of losing friends dear to them." The film festival is being curated by Miriam Petty 02G 04PhD, assistant professor of radio, television and film at Northwestern University. A related exhibit of Billops' art, "There's Nobody Coming for Us but Us: Prints by Camille Billops," will be on display at Woodruff Library's Level 2, curated by graduate student Clinton Fluker. "Hosting this film festival has a lot to do with having the Billops-Hatch collection here, which includes their papers, manuscripts they have written together, audio and videotapes, slides, and scripts James Hatch collected over his career as a professor of theater," McDaniels says. "They also are responsible for letting many of their friends who are artists know about Emory, some of whom have placed their papers at Emory. Over time this has become a significant part of MARBL." The film festival is the inaugural event leading to a larger exhibition in the fall of 2015 that will showcase the couple's contributions to art and history, McDaniels says. "This exhibition will feature their papers, family photos, manuscripts from theater plays, sketchbooks, and some of her artwork and prints. We will have part of the exhibition focus on the collections that have come to Emory as result of their initial gift," he says. "We are currently planning four public programs that will bring art historians and some of the living donors to Emory to celebrate the Billops-Hatch collection." McDaniels says Billops and Hatch not only have influenced the art world through their own work, but as publishers of Artists and Influence. The long-running journal documented countless artists and their work over the course of 30 years, providing valuable insight into the personas and works of many artists who otherwise may have been unknown. "As curators, we are trying to promote the collection through public programming. We have 1,200 play scripts that have been written by African Americans about African American life and history," McDaniels says. "We hope to be able to attract scholars and students who are interested in working with the collections to the university and perhaps to inspire other scholars and artists to place their works at Emory."